Context: Pink colored acrylic does not always satisfactorily replicate the natural gingival color, especially in individuals with pigmented mucosa. In such situation clear acrylic denture base material can be used. Hence, there is a need of a comparative study of the mechanical properties of the clear and pink colored denture base resins. Aims: The aim of this study is to compare the mechanical properties, i.e., tensile, flexural, compressive, and impact strength (IS) of clear and pink colored denture base resins. Settings and Design: This was comparative in vitro study. Materials and Methods: A total of 80 specimens were divided into two groups of 40 specimens each of clear and pink colored acrylic resin. Specimens for testing flexural, tensile, compressive, and ISs of acrylic resin (10 in each group) were divided. A universal testing machine was used for measuring flexural, tensile, and compressive strength (CS) while the Izod/Charpy impact tester was used for IS. Results: The mean tensile strength for clear resin (n = 10) was 30.90 ± 1.663 MPa and that for pink resin (n = 10) was 31.30 ± 8.166 MPa. The mean residual flexural strength for clear resin (n = 10) was 75.60 ± 17.212 MPa, whereas for pink resin (n = 10) was 76.10 ± 14.130 MPa. The mean CS for clear resin (n = 10) was 84.60 ± 2.503 MPa and for pink resin (n = 10) was 85.40 ± 16.222 MPa. The mean IS for clear resin (n = 10) was 11.50 ± 5.104 MPa. While for pink resin (n = 10) was 11.90 ± 1.370 MPa. 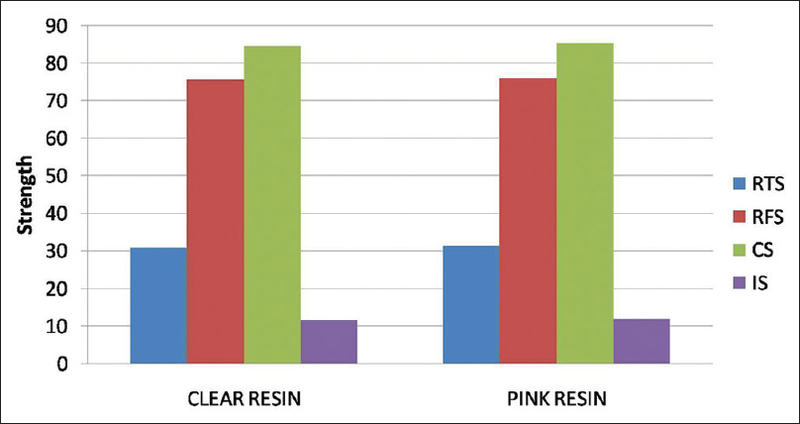 Conclusions: The results show that clear acrylic resin denture base material has mechanical properties similar to that of pink acrylic resin denture base material. Contexte: L'acrylique de couleur rose ne reproduit pas toujours de façon satisfaisante la couleur gingivale naturelle, en particulier chez les individus ayant une muqueuse pigmentée. Dans une telle situation, un matériau de base pour prothèse en acrylique transparent peut être utilisé. D'où la nécessité d'une étude comparative des propriétés mécaniques des résines de base prothétiques claires et roses. Buts: Le but de cette étude est de comparer les propriétés mécaniques, c'est-à -dire, la traction, flexural, compression et résistance aux chocs (IS) des résines de base pour prothèses dentaires de couleur claire et rose. Paramètres et conception: Il s'agissait d'une étude comparative in vitro. Matériels et méthodes: Un total de 80 échantillons ont été divisés en deux groupes de 40 spécimens de résine acrylique claire et de couleur rose. Les spécimens pour les essais de résistance à la flexion, à la traction, à la compression et à l'IS de la résine acrylique (10 dans chaque groupe) ont été divisés. Une machine d'essai universelle était utilisé pour mesurer la résistance à la flexion, à la traction et à la compression (CS) tandis que le testeur de choc Izod / Charpy a été utilisé pour IS. Résultats: La moyenne la résistance à la traction pour la résine claire (n = 10) était de 30,90 ± 1,663 MPa et celle pour la résine rose (n = 10) était de 31,30 ± 8,166 MPa. Le résiduel moyen la résistance fl exurale pour la résine claire (n = 10) était de 75,60 ± 17,212 MPa, alors que pour la résine rose (n = 10) était de 76,10 ± 14,130 MPa. Le CS moyen pour la résine claire (n = 10) était de 84,60 ± 2,503 MPa et pour la résine rose (n = 10) était de 85,40 ± 16,222 MPa. La moyenne IS pour la résine claire (n = 10) était 11,50 ± 5,104 MPa. Alors que pour la résine rose (n = 10) était de 11,90 ± 1,370 MPa. Conclusions: Les résultats montrent que base de prothèse en résine acrylique claire le matériau a des propriétés mécaniques similaires à celles du matériau de base pour prothèse en résine acrylique rose. Good complete denture prosthesis should provide esthetics, restore function, and be biocompatible with the supporting and surrounding oral tissues. Polymethylmethacrylate (PMMA) is the most widely used material for the fabrication of denture bases. The advantages of PMMA include excellent esthetic properties, adequate strength, low water sorption, lack of toxicity, facility of repair, and construction by a simple molding and processing technique. Inherent drawbacks of this material are fracture as a result of fatigue when subjected to intra-oral forces and failure to withstand extraoral impact forces. Pink colored acrylic is used as a final denture base material in almost every part of the world on a routine basis. However, more often this pink color does not satisfactorily replicate the natural gingival color, especially in individuals with pigmented mucosa. Although there have been many improvements in the physical properties of this conventional pink colored acrylic, somewhere, it still lacks the replication of the gingival color which matters the most in Caucasians who tend to have heavy melanin pigmentation on their gingiva. There may also be patients that are allergic to the dye used in the pink colored acrylic material. In such situation, clear acrylic denture base material is a suitable alternative. Hence, there is a need for a comparative study of the mechanical properties of the clear and pink colored denture base resins. There is no difference in the mechanical properties of conventional and clear acrylic resins. There is a difference in the mechanical properties of conventional and clear acrylic resins. This in vitro study was performed in order to compare the mechanical properties of two types of denture base materials. The materials used in this study were conventional heat cure acrylic resin (DPI heat cure material shade-pink) and heat cure acrylic resin (DPI heat cure material shade-clear) as shown in [Table 1]. A total of 80 specimens were prepared and divided into two groups of 40 specimens each according to the material to be tested. Specimens for testing flexural, tensile, and compressive and impact strengths (ISs) of denture base acrylic resin (10 in each group) were fabricated in stainless steel dies [Figure 1]. The dimensions of the specimens for each test were made according to the specification for each performed test. The dies were invested in a denture flask (Jabbar Varsity Flask. India) using type III dental stone (Kalstone, Kalabhai, India). Once the dental stone was set, the two halves of the flasks were separated, and the dies were lifted out of the mold. Sodium alginate separating media was then applied to the mold. The pink and clear acrylic resin denture base powder and liquid were mixed according to the manufacturers specifications, respectively. On attaining the dough stage the materials were packed in the molds. The denture flasks were then clamped in a bench press to ensure even flow of the material within the mold and benched cured for 24 h before placing it in the acrylizer. Long curing cycle of hot water bath 74°C for 9 h was used to cure the samples in acrylizer (Wassermann Dental). After the completion of curing cycle, the flasks were cooled for 1 h and the samples were retrieved. All prepared specimens were then stored in a distilled water bath at 37°C for 48 h before testing. A universal testing machine (Star Testing System, India) was used for measuring the flexural, tensile and compressive strengths while the Izod/Charpy impact tester (International Equipments, India) was used for IS. Ten dumbbell shaped specimens of each material were prepared with a length of 115 mm, width of 19 mm in the center section, and a thickness of 6 mm according to specification American Society for Testing Materials (ASTM) D638 [Figure 2]. The tensile strength of each specimen was determined using universal testing machine (Star Testing System, India. Model-STS 248) with a cross head speed of 5 mm/minute. Ten specimens were prepared from each material with the following dimensions: length of 80 mm, width of 12.7 mm, and a thickness of 3 mm according to specification ASTM D790 [Figure 3]. The flexural strength of each specimen was determined using universal testing machining (Star Testing System, India. Model-STS 248). The force was applied at a cross head speed of 5 mm/min until fracture occurred, and was automatically recorded by the testing machine software. The flexural strength was calculated according to the following equation: 3PL/2bd. Where, P is the fracture load, L is the span between the supports (50 mm), b is the width of the specimen (12.7 mm), and d is the thickness of the specimen tested (3 mm). Specimens of dimension 12.7 mm × 12.7 mm × 25.4 mm were used to check the CS for each material according to ASTM D695 [Figure 4]. Compressive testing determines the behavior of materials under crushing loads. The specimens were compressed in universal testing machining (Star Testing System, India. Model-STS 248) at a cross head speed of 5 mm/minute and the deformation at various loads was recorded. Izod/Charpy impact tester (International Equipments, India) was used to determine the IS of specimens of dimension 64 mm × 13 mm × 3 mm as per ASTM D 256 [Figure 5]. Data were analyzed using SPSS Inc. released in 2008. SPSS Inc., SPSS for Windows, version 17.0 Chicago, IL, USA. Results were calculated as means and standard deviations for normally distributed variables. Between group differences was compared using independent-samples t-test. Probabilities of <0.05 were accepted as significant. The mean tensile strength (TS) for clear resin (n = 10) was 30.90 ± 1.663 MPa with minimum strength of 29 MPa and maximum 34 MPa. While mean RTS (n = 10) for pink resin was 31.30 ± 8.166 MPa with minimum strength of 20 MPa and maximum 46 MPa [Table 2]. The difference between mean RTS for clear resin (30.90 ± 1.663) MPa and pink resin 31.30 ± 8.166 MPa was −0.400 MPa. There was no statistically significant difference when the mean tensile strength for the two groups were compared (P = 0.881) [Table 3]. The mean flexural strength (FS) for clear resin (n = 10) was 75.60 ± 17.212 MPa with minimum strength of 40 MPa and maximum 101 MPa. While mean RFS (n = 10) for pink resin was 76.10 ± 14.130 MPa with minimum strength of 59 MPa and maximum 98 MPa [Table 2]. The difference between mean RFS for clear resin (75.60 ± 17.212) MPa and pink resin (76.10 ± 14.130) MPa was −0.500 MPa. 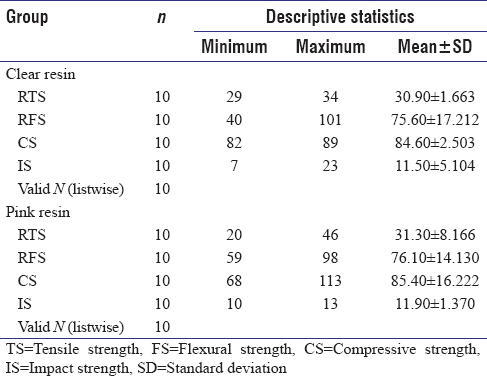 There was no statistically significant difference when the mean flexural strength (RFS) for the two groups were compared (P = 0.944) [Table 4]. The mean CS for clear resin (n = 10) was 84.60 ± 2.503 MPa with minimum strength of 82 MPa and maximum 89 MPa. While mean RFS (n = 10) for pink resin was 85.40 ± 16.222 MPa with minimum strength of 68 MPa and maximum 113 MPa [Table 2]. The difference between mean CS for clear resin (84.60 ± 2.503) MPa and pink resin (85.40 ± 16.222) MPa was −0.800 MPa. There was no statistically significant difference when the CS for the two groups were compared (P = 0.879) [Table 5]. The mean IS for clear resin (n = 10) was 11.50 ± 5.104 MPa with minimum strength of 7 MPa and maximum 23 MPa. While mean RFS (n = 10) for pink resin was 11.90 ± 1.370 MPa with minimum strength of 10 MPa and maximum 13 MPa [Table 2]. The difference between mean IS for clear resin (11.50 ± 5.104) MPa and pink resin (11.90 ± 1.370) MPa was 0.239 MPa. There was no statistically significant difference when the mean IS for the two groups were compared (P = 0.814) [Table 6]. [Figure 6] shows the graphical representation of the comparison of mechanical properties of clear and pink acrylic resins with statistically insignificant difference in the values. This study was conducted to assess and compare the mechanical properties of clear and pink denture base materials. The flexural, tensile, compressive, and ISs of both resins were analyzed. The results of this study clearly indicated that there is no significant difference in the mechanical properties of both denture base materials. Hence, the null hypothesis was accepted in this study. A transitory force applied to the denture either due to some accident or due to constant minor chewing forces may lead to fracture of the denture. Thus testing the mechanical properties of the denture base resins is important. Flexural strength is useful in comparing denture base materials because it reflects the complex stresses applied to the denture during mastication and it provides an indication of a materials' rigidity.,, Tensile strength is the capacity of a material or structure to withstand loads tending to elongate. Whereas, fracture of dentures by impact forces, may results from the sudden application of force to the dentures. 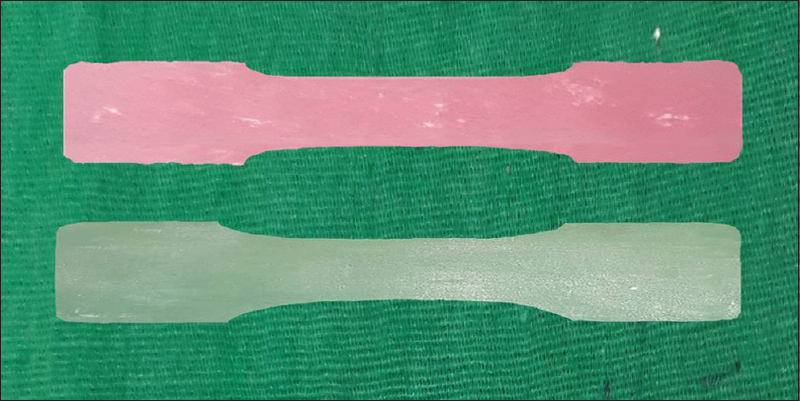 Such types of fractures are more likely due to the accidental dropping of dentures on surfaces during cleaning of dentures by patients.,, As the results of the study show no major difference in the mechanical properties of the pink and clear acrylic resins, it cannot be said that the clear acrylic resin is inferior to the pink acrylic resin in any means. Yesil et al. conducted a study to check the Vickers hardness of denture base materials. In their study, pink denture base material was compared to clear denture base material and polyamide denture base material. The results showed that pink denture base material had highest Vickers hardness among all. There have been a few cases that have reported the use clear acrylic resin as denture base material instead of pink resin. Barclay et al. have reported a case in which the patient was allergic to the red color dye material used in the acrylic resin. The patient was given clear acrylic dentures which solved her problem. Similarly, Sushma et al. reported that a 60-year-old female patient with hyperpigmented oral mucosa was given clear acrylic dentures for characterization. In dark-skinned individuals or with hyperpigmented oral mucosa, giving pink or dyed acrylic resin dentures may give an artificial look. Thus, it is best to use clear acrylic resin denture base in such cases. Although this study shows that there is the insignificant difference in the mechanical properties of the two denture base materials, however, being an in vitro study further in vivo studies are required to justify these results. Furthermore, the color stability and staining ability of the clear acrylic resin should be evaluated in future studies. Though the null hypothesis was accepted in this study, it must be noted that this is an in vitro study and similar in vivo studies must be conducted. The study within its limitations proves that clear acrylic resin denture base material has mechanical properties similar to that of pink acrylic resin denture base material and hence can be used for fabrication of dentures without hampering its properties. This will be of great use in individuals with pigmented mucosa, a condition commonly found in India. Craig RG, Powers JM. Restorative Dental Materials. 11th ed. Missouri: St. Mosby, Louis; 2002. p. 636-89. Beyli MS, von Fraunhofer JA. An analysis of causes of fracture of acrylic resin dentures. J Prosthet Dent 1981;46:238-41. Sushma R, Farias A, Khandagale TS, Sanyal PK. Use of heat cure clear acrylic as a permanent denture base material: A case report. J Res Dent 2016;4:86-9. Doğan OM, Bolayir G, Keskin S, Doğan A, Bek B. The evaluation of some flexural properties of a denture base resin reinforced with various aesthetic fibers. J Mater Sci Mater Med 2008;19:2343-9. Alla RK. Dental Materials Science. 1st ed. New Delhi, India: Jaypee Brothers Medical Publishers (Pvt) Ltd.; 2013. p. 248-4. Meng TR Jr., Latta MA. Physical properties of four acrylic denture base resins. J Contemp Dent Pract 2005;6:93-100. Machado AL, Bochio BC, Wady AF, Jorge JH, Canevarolo SV Jr., Vergani CE, et al. Impact strength of denture base and reline acrylic resins: An in vitro study. J Dent Biomech 2012;3: 1758736012459535. Yesil DZ, Ozdogan A, Ulu H, Ozbayram O. Evaluation the vickers hardness of denture base materials. Open J Stomatol 2016;6:114-9. Barclay SC, Forsyth A, Felix DH, Watson IB. Case report – Hypersensitivity to denture materials. Br Dent J 1999;187:350-2.